I wish there was more information about this impressively massive sonobe model, but all I can glean is that it appears to have been made by Imogen Warren, and was posted by Room 3. So awesome. Awesome! It seems like you just make it out of some posterboard. The folding would be a little difficult but it would work ok. 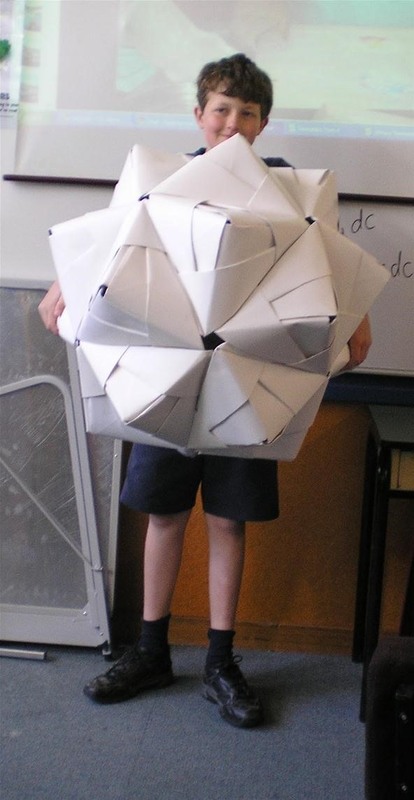 I once made a large one out of full sized sheets of paper and then had to stuff it to have it keep its shape. That doesn't seem to be what is happening here though. ah stuffing, never considered that might be an issue. I've been scheming about making a really big one.